1. Choose a “Relevant Phrase to Link From”. site:https://seo-gold.com/ "Relevant Phrase to Link From"
3. Choose one of the relevant webpages to link to. 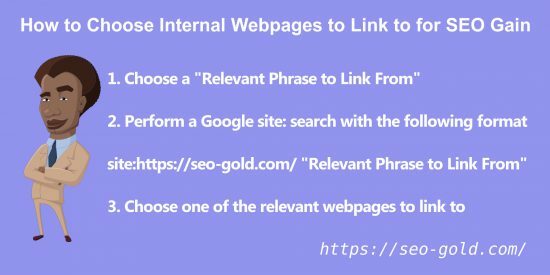 Using the above simple SEO tip you can quickly find the best internal pages to link to helping both the linked from and as important linked to webpages. The above SEO technique can be used for any domain you plan to link to, doesn’t have to be just for internal links.